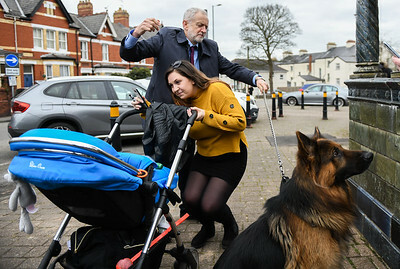 Here you can view my image of British politician and Labour Party Leader, Jeremy Corbyn handling Alsatian dog, Acer, on the streets of Newport in South Wales, UK. The image was used throughout the national press and television. I've had lots of inquires regarding this image, personal prints can be ordered online. For editorial usage please get it touch for licensing costs. The image cannot be used without my permission in any way and is subject to copyright. Any unauthorized usage will be acted upon.